Both the title single and the album rose to the top of their respective US charts (the Billboard Hot 100 singles chart and the Billboard 200 albums chart). The title song and its follow-up, "Please Mr. Please", were both top 10 on three Billboard charts: the Hot 100, Adult Contemporary, and Country, and were both also Number One singles in the Netherlands. Have You Never Been Mellow was not as successful outside the US, and failed to chart in some countries like the United Kingdom. However, the title song was Newton-John's first charting single in Japan, where it reached number 26 on the Oricon singles chart. Newton-John received a Grammy nomination for Best Female Pop Vocal Performance for her work on the song "Have You Never Been Mellow," but lost to "At Seventeen" by Janis Ian. The album was certified Gold in the US. The LP sold 169,380 in Japan. 10. "The Air That I Breathe"
The album was originally released on vinyl LP and audio cassette on 12 February 1975, on MCA Records (Cat. no. MCA-2133). MCA released it on CD in the mid-1980s. In 1990, it was released in Japan on EMI as part of their PASTMASTERS series (Cat. no. CP21-6075). This was a superior release in terms of sonic quality over the MCA release, and contained all the original album artwork (front and back cover photos). Included was an obi, and a simple, folded white paper insert with all the song lyrics in English on one side, and Japanese on the other. (The original LP release did not include lyrics). Note: Whereas the original US album contained 11 tracks, in Japan it included a 12th song, "I Honestly Love You", included on the CD. In 1998, Festival Records in Australia released the album on CD as part of their "Digitally Remastered" series (Cat. no. D35465 / D21046). This release featured the complete original artwork, and no lyrics insert. General sonic quality was good. However, as with several other Festival releases, there was an error, as the first drum downbeat of track 7, "It's So Easy", was cut off. Also note: The CD contains 12 tracks, in this case the 12th being "If You Love Me (Let Me Know)", which is how the original LP was released in Australia. 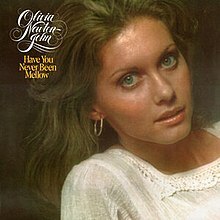 That is because the song "If You Love Me (Let Me Know)" was first released in the US only, in 1974, as the only newly issued song on Olivia's 1974 US LP of the same name. In the wake of the single's big US success, many non-US territories opted to include the song on the next Newton-John album, which turned out to be Have You Never Been Mellow. ^ "American album certifications – Olivia Newton-John – Have You Never Been Mellow". Recording Industry Association of America. If necessary, click Advanced, then click Format, then select Album, then click SEARCH. ^ Okamoto, Satoshi (2006). Oricon Album Chart Book: Complete Edition 1970–2005. Roppongi, Tokyo: Oricon Entertainment. p. 349. ISBN 4-87131-077-9. This page was last edited on 9 March 2019, at 01:25 (UTC).